We are currently looking for more gigs and have a couple of things in the pipeline. Also we are getting ready to release our first album titled 11 soon. 2.Recently you have released a full length, can you tell us a little bit more about the musical style you where going for with this release? Like i mentioned in the previous question we haven’t released it yet but we are hoping to have it released next month (august). It has taken some time due to financing everything ourselves and the thing called “life” getting in the way. 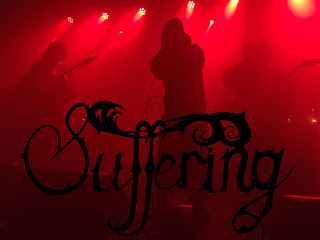 For Suffering though we are all big fans of black metal and its various subgenres and also doom metal too so play a mixture of black and doom but more on the black metal end of the spectrum. Playing songs with our kind of subject matter the best and most effective way to get the message across and the right atmosphere it has to be played in a black metal format. 3.The band has been around since 2012 but you waited until this year to put out the full length, can you tell us a little bit more about the earlier years? Yes that is correct. Originally the band was started in 2012 with various members from other black metal bands from around the country but due to distance/travelling etc it was too difficult to make it work so i stopped the band until roughly 2 years ago when i found a whole new lineup which luckily came together very quickly and just over a year later 11 was written and recorded. 4.A lot of your lyrics deal with Satanism and The Occult, can you tell us a little bit more about your interest in the dark arts has evolved during the years? I don’t really like to go into too much detail about these kind of things because i think a lot of it should be discovered and researched yourself without somebody holding your hand and showing you the way but i have many many years of research into satanism, occultism, ritual, ancient civilisations and their gods/demons etc and our themes and interests run deep to the point where subjects to choose from could never be exhausted. 11 has many themes and subjects running through it but tied together by mainly one thing but what those themes are is something i will let people discover for themselves and make their own minds up. 5.What is the meaning and inspiration behind the name 'Suffering'? When i originally started the band is was just a straight DSBM band pretty much but when i ressurected the band i felt that subject matter for a DSBM band would be very limiting for me personally. I would have plenty to write and sing about but i realised that those subjects were something i wasn’t ready to whole heartedly face and shine a spotlight on so to speak but those elements are still there in our music and is a underlying thing. Maybe we will return to the full DSBM at some point, who knows? So now in the context of that band we feel it still works and fits nicely because EVERYTHING is suffering, life, the need for money, work, family, children, relationships, being alone, being with people, mental health, illness, religion. It is all suffering and everybody suffers to some extent every day, some more than others but we all do plus we wanted our music to portray that also. We want people to suffer with us through this experience whether it is listening to our music or seeing us perform live. 7.I have noticed from what i have seen of pictures from live shows the band members wear cloak's on stage, would you consider your life performance as being ritualistic? Yes that is a very exactly correct observation. Ritual is a very big part of this band also 11, whoops i gave away one of the albums subjects then but in all seriousness yes ritual plays a big part. 8.Do you have any touring or show plans fir the future? Well we are on the look out for more gigs of course but currently we are arranging to travel to the Netherlands because we have been asked to play a gig over there but other than that nothing in concrete just yet. 9.In 2017 you where also a part of a compilation, do you feel this release was very helpful on getting your name known in the underground? Not really haha. It was a good thing to be a part of and appreciate being asked but it didn’t really have any impact on anything at all, negative or positive. We chose to do everything for the first album entirely ourselves to have complete control over everything because as a new band i don’t think you should jump into the “corporations” and business side with labels until you have decided and found where you are going yourselves but once the album is released we will certainly be looking for a record label for the future of the band. 11.On a worldwide level how has the reaction been to your music by fans of black and doom metal? It has only been on a very small scale at the moment because we have only officially released 2 or 3 songs so people are yet to hear the whole thing. With this band you can’t listen to one or two songs and understand what we are about or what we do because our songs, inspirations, styles we incorporate are so vast. Once people listen to the whole of 11 then they will know but so far from what we have heard from people it has been very positive, although i think some people are missing the point entirely but like i said i think that would be down to not hearing the whole album so they can’t make a justified and accurate opinion. 12.What is going on with some of the other bands or musical projects these days that some of the band members are a part of? Currently nothing. I am the only member of the band that has other projects/bands but all of those are currently inactive due to Suffering being the main focus. I do have a full length solo album fully recorded that i have been sitting on since 2014 but that may or may not ever get released. I am also planning a follow up at some point to the E.P They Won’t Stay Dead by my project Perverted Funeral Home but that could be either in the near or distant future. 13.Where do you see the band heading into musically during the future? The same direction that features on 11 but the only difference will be that our new music will features all of our elements amplified. The heaviest thing on 11 will be even heavier on the follow up, just like the most melodic/atmospheric thing on 11 will be even more melodic/atmospheric on the follow up etc. Bands must always grow and evolve but that doesn’t mean changing entirely and abandoning what you have done before. That is being dishonest with yourself and the people who follow you. 14.What are some of the bands or musical styles that have had an influence on your music and also what are you listening to nowadays? Black metal and doom metal are the obvious ones, with a bit of death metal but not too much haha. And obviously we are inspired by all the standard black metal bands you would expect to be named so i won’t waste time on that but bands that i personally would say that have been big influences and played a big part in our forming would be Shining, Skitliv, Akercocke, Triptykon, Primitive Man and My Dying Bride to name a handful. Thank you for doing this interview with us and also for the very positive review you did for us. It is greatly appreciated. We hope that people will check out 11 when it comes out and give us a chance. Also come see us live and witness the way this band is meant to be presented. AVE!